Step on stage and shine with the excitement and magic of live musical theater! 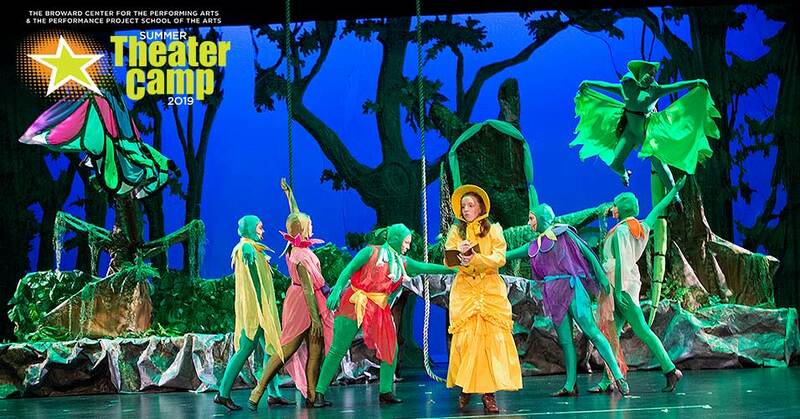 The Broward Center for the Performing Arts and The Performance Project School of the Arts offers a fun-filled summer theater camp for campers to gain hands-on experience in musical theater, acting, dance, voice and technical production. With two sessions and age-specific groups and shows, there is no reason to miss out on the fun. Each session culminates with a live performance in the Amaturo Theater at the Broward Center. Plus, every camper performs because everyone is cast in the show. As they experience the joy of live musical theater, campers build self-confidence, engage their imaginations and learn the importance of teamwork. Early drop-off (8 AM – 9 AM) and late pickup (4 PM – 6 PM) are available. Sibling and multi-session discounts available. Camp cost includes dinner prior to each child’s performance and a variety of items to enhance campers’ experience and provide memories that last a lifetime. Campers may bring their own bag lunch. All shows and dates are subject to change. Discounts may not be combined. All sales final. Classes will consist of beginning levels of acting, singing, dance (tap, jazz, ballet) and arts & crafts. Campers’ daily classes will consist of intermediate levels of acting, singing, dance (tap, jazz ballet) and technical production. Following a career as a professional actress, Nina Felice founded The Performance Project School of the Arts to nurture young talent and encourage the pursuit of their creative dreams. With a bachelor’s degree in Fine Arts and a master’s degree in Child/Family Psychology, Nina incorporates the two disciplines into her teaching techniques to guide and motivate young performers.